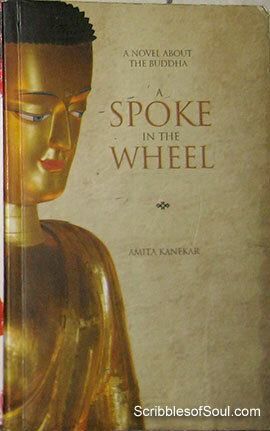 I have just finished reading ‘A Spoke in the Wheel’ by Amita Kanekar, a historical fiction that revolves around Buddha and Asoka. The protagonist of the novel is Upali, a Buddhist Monk, who wishes to write the story of Buddha’s life minus all the myths and fanciful legends. However, the news of his attempted biography reaches the ears of Asoka, who wants to make him the official biographer of Buddha’s life. The simple exercise of writing turns into a political ambition and Upali is unwittingly embroiled into controversies. Can Upali protect his story from becoming a toy in Asoka’s hands and will he be able to paint Buddha’s life in true colors, forms the basic framework of the novel. The novel starts off well, with the birth of Buddha in 566 BC in Kapilavastu, however, I got confused when I reached the second chapter, set in 256 BC, describing the life in Maheshwar Monastry. It is only after the completion of second chapter, I could find out that the first chapter is actually a part of Upali’s biography of Buddha! It took me some time to delineate the chapters that belonged to Buddha’s time, from the ones that carry the tale of present times i.e. Ashoka’s reign. However, once the confusion was over, I started enjoying the novel. The main essence of the novel is to de-glamorize Buddha’s life and to present him as a human, rather than a God. And Amita does succeed in doing so to a large extent, with the help of Upali, the in-veritable cynic. However, Upali, himself is living in a dream world, and is never able to recognize the good qualities of Ashoka. He notices that the law and order situation has improved, robberies have decreased, Asoka has made a number of hospitals and inns for the comfort of his residents, has successfully banned sacrifice and hunting, where Upali’s gentle appeals failed, and is even providing medical care to the animals. Despite noticing all these good acts of Asoka, his prejudice remains firm and he never gives credit to the benevolent Raja and just imagines all these acts to be political in nature. By doing so, Amita has deliberately made the character of Upali questionable, as the person who is not able to fully grasp the present, could hardly be trusted to present a true image of the past and has thus put a question mark to Upali’s chronicles of Buddha’s life and gives the reader a fair chance to either believe or disbelieve the account put forward by him. I liked the novel for its bold approach to present the Buddha as a confused man, who was dissatisfied with his times and the blind unmindful adherence to traditions and tried to bring about a change. It helps to understand the real Buddha, veiled behind the shods and shams of Godly status, ascribed to him by his late followers. All in all, a good novel that will make one think twice about following the traditions blindly, encouraging to question the age old customs and to see beyond the accepted realms.